Each day I drop my entrecard on between 50 and 100 blogs. Some I glance at and determine that they aren't my "thing". Others I enjoy, when they post (specially pictures). This one, among others... I LOVE. 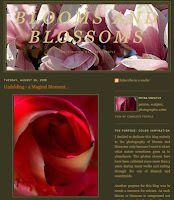 Blooms and blossoms blog is written by Petra Voegtle, "painter, sculptor, photographic artist". If you love flowers, you will adore her blog. For the past several days, she has featured the most amazing roses. There are also dahlias, larkspur, and hydrangeas among others. Oh, my gosh - the hydrangea photographs actually cause a visceral reaction in me.... I want them, I want the photograph to stare at constantly! Check it out. You won't be sorry!! Jael - you are really sweet. Thank you so much for this nice little feature. I truely appreciate it and it makes me very happy if I can inspire other people a little bit. I am in total agreement - She is an awesome photographer! Some of her photos even look like paintings. Cudos to you for writing about her. - She's incredible! I do agree with what you are saying - I also post on her site and I always enjoy her photos. Cudos to you for this feature! I agree, I love this site. Wonderful, wonderful pictures.